The actual delivery time per product is listed on the website of FAM Flower Farm. Dahlia tubers are delivered from mid-April after the risk of frost is gone, until that time we stock the tubers under perfect conditions for you. Unfortunately, we can not deliver the tubers earlier because we can't guarantee the quality, dahlia tubers are very sensitive to frost or conditions that are too dry or wet during the winter period. We supply the last tubers until about mid-June, after then it is too late to plant them. Tulip bulbs and daffodil bulbs are supplied from mid-September to early December. 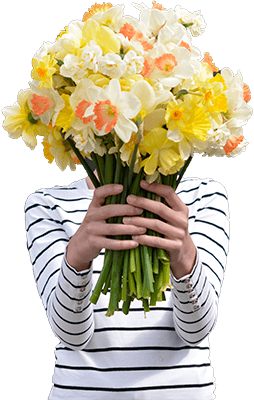 We supply tulips flowers directly or on a every desired delivery date, which you can indicate when placing the order. Tulip flowers are only available from January until end of April. Stock products are dispatched in the same week of ordering. In the case of non-stocked products, the date of delivery depends on our breeding season. If your order includes products with different delivery times, your order will be shipped when your order is complete. In this case, the longest delivery time applies to the entire order. We deliver our products within the specified delivery time. For some countries, our supplier needs more time to deliver the products to you. This means your order will be delayed. If your order is delayed, you will receive an email from FAM Flower Farm. Once your order has been sent, you will receive a shipping confirmation by e-mail. In this email message you will find a Track & Trace number. Using this number and instructions from the shipping confirmation, you can track your order online. If no one is present at the delivery address when our carrier delivers your order, the carrier will leave an instruction card in the mailbox. The carrier will take your order back or deliver at the neighbors. The instruction card states what action you can take to re-deliver your order. If you do not take action, the carrier will re-deliver your order the next business day, unless stated otherwise on the instruction card. The risk of damage or loss of delivery is borne by FAM Flower Farm. So you do not have to worry about it. If you have received your order, we ask you to inspect the products properly. The inspection can take place after you have signed a waiver for the driver. With this signature, you only confirm the number of packages you received. When the driver resumes his work, you can carry out the inspection. Despite our efforts to deliver your order accurately, it may seem that you are not satisfied with something. Once you have received your order, we ask you to inspect the products properly. Even if you do not use the products immediately, it is important that you inform us within 3 working days of any damage, defect or shortage upon delivery. If you notice damage or delivery shortage we would like to receive photos for a prompt handling. 6 - A detailed photo (close-up) of the actual damage to the item.